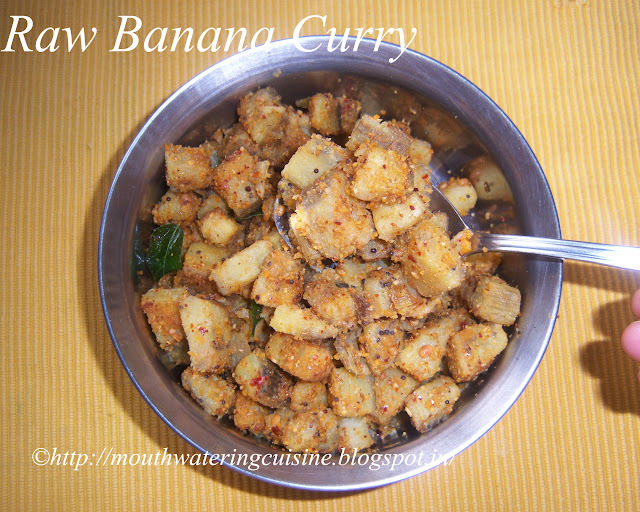 Raw banana curry with curry powder can be consumed with rice. It is a dry curry. I love this curry very much. It is very easy to make. It requires very less ingredients. We need to have curry powder readily available or else we can make it instantly also. You can make curry powder well in advance and keep it. My dad also love this curry very much. Peel the skin of banana and cut it into blocks. Add water and banana pieces in a kadai. Add salt and turmeric powder and bring it to boil. When they cooked completely, drain excess water and allow them to cool. Heat oil in a kadai, add black gram and bengal gram. Add mustard seeds, cumin seeds and curry leaves. Allow it to splutter. Add boiled banana pieces. Saute it for 2 seconds. 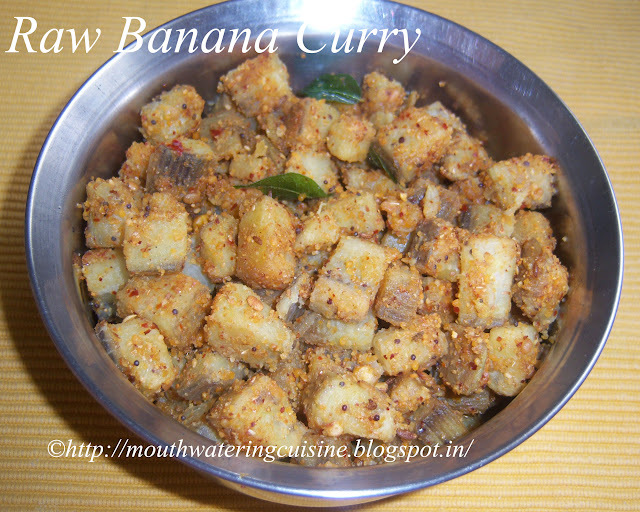 Once the moisture in banana pieces dried out, add curry powder. Saute well. Check salt and add if necessary. Serve Banana Curry with rice. For more curry recipes click here. Thank you visiting my blog. Hope you liked all my recipes. Any feedback and comments are appreciated.